The recent storms in Central Arkansas have not impacted us here at the museum directly. We lost power for a short time, but otherwise have been unaffected. The high water (currently at about 19 feet and expected to crest at 20 feet) will force us to be closed Friday. As you can see, the water is above our gangway. On the morning of April 27th, 1865, just a few weeks after the end of the Civil War and the assassination of President Abraham Lincoln, the worst maritime disaster in American history occurred, right here in Arkansas waters. 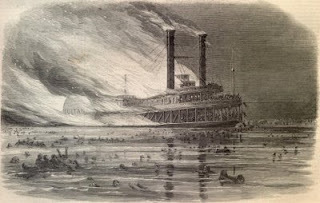 The side-wheel steamship Sultana, shown above, exploded and burned on the Mississippi River, just a few miles upstream from Memphis, TN. The burning hulk drifted to the Arkansas side of the river, finally sinking near Mound City, Arkansas before dawn. Approximately 1,800 men were killed. Most of the men killed were Union soldiers just released from Confederate Prisoner of War Camps including Cahaba and the infamous Andersonville prison. 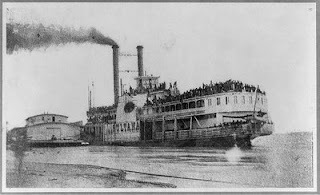 When Sultana exploded, many men were forced into the cold waters of the Mississippi, which was swollen with with spring flood waters. Many drowned, while hypothermia claimed others. All but two of Sultana's officers, including her Captain, were killed. An exact toll can never be determined, because the official records were known to be incomplete (for example, a number of dead men were identified, but were not on the passenger list). Many bodies were never recovered at all. A number of victims were buried in mass graves in the Memphis area. Only a single photograph of Sultana is known to exist. It was taken at Helena, Arkansas by T.W. Banks and clearly shows the severe crowding of the decks. Because this disaster took place so soon after the end of the Civil War and just days after the assassination of President Lincoln (and the day after John Wilkes Booth and co-conspirator David Herold were finally captured), it was largely overshadowed by the greater tragedies the nation had faced. Several books have been written about Sultana's loss. One, Loss of the Sultana and Reminiscences of Survivors, was originally published in 1892 and is available on Google Books. There is also an online, searchable database of Sultana passengers. Top illustration - a drawing from Harper's Weekly, originally published in the May 20th, 1865 issue. Not many people know it, but there is a U.S. Navy ship sailing the oceans today named for a Korean War hero from Arkansas. 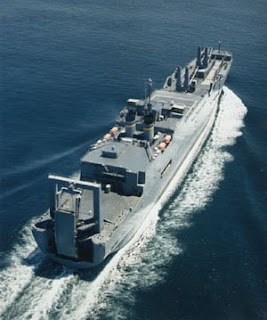 USNS Gilliland (T-AKR-298) is a Large, Medium Speed, Roll-On/Roll-Off Cargo vessel, or LMSR. A single LMSR can carry enough ammunition, food, water, fuel, equipment and other supplies to sustain up to 20,000 troops for 15 days. 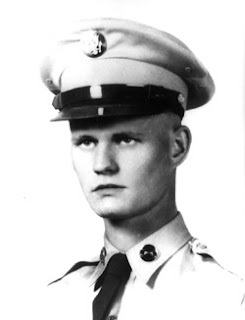 On April 25, 1953, Corporal Charles L. Gilliland of Mountain Home, Arkansas was killed near Tongmang-ni, Korea while serving in the U.S. Army. He received the Congressional Medal of Honor for his actions. "Cpl. Gilliland, a member of Company I, distinguished himself by conspicuous gallantry and outstanding courage above and beyond the call of duty in action against the enemy. A numerically superior hostile force launched a coordinated assault against his company perimeter, the brunt of which was directed up a defile covered by his automatic rifle. His assistant was killed by enemy fire but Cpl. Gilliland, facing the full force of the assault, poured a steady fire into the foe which stemmed the onslaught. When 2 enemy soldiers escaped his raking fire and infiltrated the sector, he leaped from his foxhole, overtook and killed them both with his pistol. Sustaining a serious head wound in this daring exploit, he refused medical attention and returned to his emplacement to continue his defense of the vital defile. His unit was ordered back to new defensive positions but Cpl. Gilliland volunteered to remain to cover the withdrawal and hold the enemy at bay. His heroic actions and indomitable devotion to duty prevented the enemy from completely overrunning his company positions. Cpl. Gilliland's incredible valor and supreme sacrifice reflect lasting glory upon himself and are in keeping with the honored traditions of the military service." For more information about Corporal Gilliland, please visit the MSC Medal of Honor Recipient web page. For more information about USNS Gilliland, please visit her home page. For more information about the LMSR program, please visit the program information web site. On 24 April, 1988, USS Bonefish (SS-582) was conducting ASW (anti-submarine warfare) exercises with USS Carr (FFG-52) off the coast of Florida. While submerged, an electrical short started a small fire that quickly grew. While Bonefish was surfacing, the fire caused an explosion in the battery well. Smoke quickly filled the submarine as she was brought fully to the surface. When attempts to contain the growing fire failed, the submarine's Commanding Officer, ordered the crew to evacuate to the deck. Three men - LT Ray E. Everts, RM1 (SS) Robert W. Bordelon, Jr., and YN3(SS) Marshall T. Lindgren died due to smoke inhalation. The rest of the crew were able to safely evacuate and were rescued. USS Carr was able to launch both a helicopter and ship's boat to assist in the evacuation. One SAR (Search And Rescue) Diver, AW3 Larry Grossman, spent several hours in the water and received the Navy and Marine Corps Medal for his heroism. Once the fire was extinguished, Bonefish was towed to Charleston, SC. Her damage was deemed to be so extensive that she could not be economically repaired. She was decommissioned on 28 September 1988. 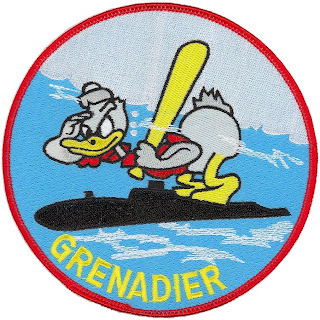 While patrolling the Indian Ocean, USS Grenadier (SS-210), was badly damaged by a Japanese air attack. Her crew attempted to make repairs, but were forced to scuttle the submarine when Japanese ships closed in. Grenadier was lost on her sixth war patrol. Her entire crew was captured. Four men died as prisoners of war. Additional information and photographs can be found at the Naval Historical Center website. Gudgeon was a submarine of “firsts.” She was the first American submarine to be sent on an offensive war patrol. She was the first American submarine to patrol along the Japanese coast itself. On January 27, 1942 Gudgeon became the first American submarine to sink an enemy warship in World War II, the Japanese submarine I-73. Gudgeon would eventually complete 11 successful war patrols. She tallied a total of 14 confirmed kills equaling 71,372 tons sunk. She won the Presidential Unit Citation and earned 11 battle stars. Gudgeon got underway for her 12th war patrol on April 4, 1944. After stopping at Johnston Island on April 7, 1944 for fuel, she was not seen or heard from again. 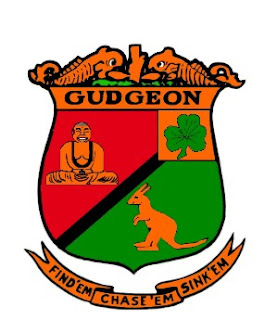 On 7 June 1944, Gudgeon was officially declared overdue and presumed lost. A postwar examination of Japanese records did not uncover an attack that could be tied to Gudgeon's loss with certainty. "...the first hit the bow and the second hit the bridge. [A] big yellow-green explosion was seen in the center of the boat." Fuel was observed spouting from the submarine in a "big pillar", then spreading in a large pool as the submarine foundered. While is is not definative proof, this report does provide the best clues to Gudgeon's loss. AIMM would like to thank all of the Razorback Crewmembers Association members who came from around the country to be here and work this past week. Lots of projects were completed, and alot of progress was made on others. 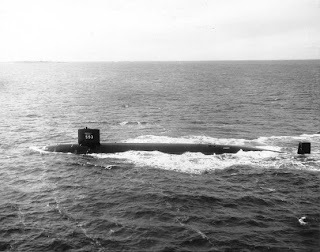 As everyone who has studied Cold War submarine history knows, USS Thresher (SSN-593) was lost on 10 April, 1963. 129 men lost their lives in the worst post-war disaster to strike the submarine service. AIMM has in its archives a partial "Welcome Aboard" booklet from USS Thresher, issued sometime in few months, or possibly just days, before Thresher's loss. It features the biography of LCDR John W. Harvey, Thresher's Commanding Officer, who had only assumed command on 18 January, 1963 and was lost when Thresher went down. 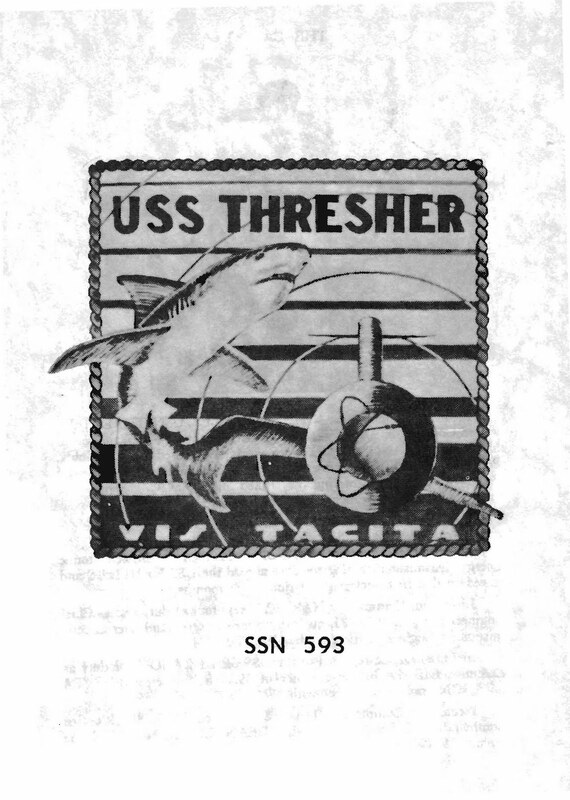 The booklet is only six pages, and includes a cutaway diagram showing the general layout of Thresher's decks as well as a short history of Thresher's World War Two namesake (SS-200) and the shark that the original Thresher was named for. USS Thresher (SSN-593) is the lead ship of the world's most advanced class of nuclear submarines. She is one of the most effective anti-submarine weapons in the Navy arsenal. She has the ability to operate deeper as well as more silently than her predecessors. Her advanced sonar is the most comprehensive detection system ever devised for an underwater craft. Clearly, Thresher's officers and crew were (rightly) proud of their boat. AIMM honors Thresher's memory by making this booklet available in PDF format through our website. We would like to thank the donor who made this possible (the original booklet was loaned to AIMM and the donor wanted to remain anonymous). On this day, the U.S. Navy made history by purchasing the first powered submersible. Holland's career was brief, but vital. Within 10 years, over 25 submarines were in service or under construction, each new class larger and more capable than the last. Holland was struck from the Naval Register in 1910. Unfortunately, she was sold for scrap in 1913. Fortunately, many patents were filed by Mr. Holland and many of her construction drawings remained in archives. In 2002, IBM digitally reconstructed USS Holland and brought her back to virtual life. AIMM has a copy of "The Holland Project" CD available for researchers. 46 years ago, USS Thresher (SSN-593) became the first American nuclear powered submarine to be lost. Thresher was built at the Portsmouth Naval Shipyard in Kittery, Maine, the same shipyard were Razorback was built. Commissioned in 1961 as the lead ship of her class, she conducted extensive training and trials in 1961 and 1962. On April 10th, 1963, following an overhaul, Thresher returned to sea. 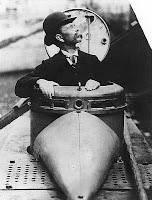 During her deep-diving tests, while near her test depth (in excess of 1,000 feet) Thresher apparently suffered a failure of a pipe fitting somewhere in the Engine Room. The leak almost certainly caused an automatic shut-down of the nuclear reactor, and a combination of loss of power, flooding and a previously unknown fault in the ballast system caused Thresher to sink below her test depth. At approximately 2,000 feet below the surface, Thresher's hull imploded, killing all 129 men aboard instantly. After an extensive underwater search, Thresher's wreckage was positively identified in 8,400 feet of water. Following a Court of Inquiry, the "SUBSAFE" program was developed to correct the design and construction problems that led to Thresher's loss. For additional information about USS Thresher, please visit the Naval Historical Center web site. Photograph courtesy of the U.S. Naval Historical Center. While on her ninth war patrol, USS Snook (SS-279) was lost with all hands. While the exact cause of her loss remains unknown to this day, she was likely sunk by the Japanese submarine I-56 on April 8th, 1945. Japanese records also record a combined attack by three Japanese coastal defense vessels and naval aircraft in the same area. I-56 was herself sunk by U.S. forces a few days after Snook was lost. Before her loss, Snook compiled an impressive record, sinking a confirmed 17 Japanese ships for a total of 75,000 tons, the 10th highest total among U.S. Submarines. 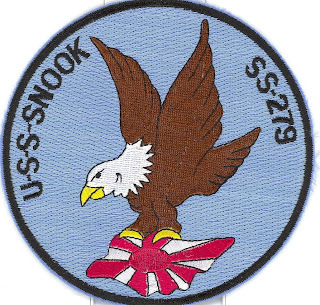 For additional information about USS Snook, visit the AIMM Snook memorial web page and the U.S. Naval Historical Center website. 52 American submarines were lost during WWII. 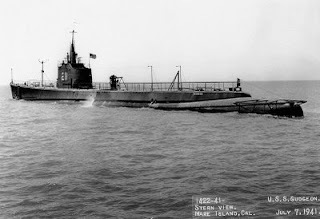 After the war, each state was assigned a submarine for commemorative and memorial purposes (California and New York were each assigned two submarines). USS Snook is Arkansas' adopted submarine. Patch from the AIMM collection, donated by Sue McLaughlin. USS Pickerel (SS-177) was a Porpoise-class submarine, designed in the 1930s and commissioned in 1937. She was similar to Razorback in many respects, but only had a test depth of 250 feet. On March 22nd, 1943, Pickerel left Midway island on her seventh war patrol. Her assigned patrol area was off the Japanese home island of Honshu. She was never heard from again. After the war, Japanese records revealed that Pickerel sank two vessels during her final patrol. The first, a submarine chaser was sunk on April 3rd and the second, the merchant ship Fukuei Maru was sunk on April 7th. There were several anti-submarine attacks carried out by Japanese forces in the area, and one of these attacks was the likely cause of Pickerel's loss.